• Where China Happens. 200 million-plus people just watched an early November basketball game between the Houston Rockets and Milwaukee Bucks. Hilarious. 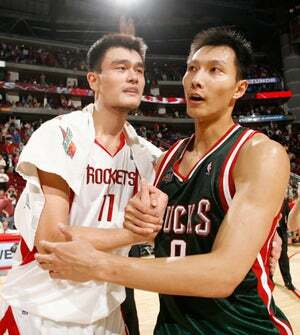 Yao and Yi each had their share of highlights in their much-anticipated Chinese Balla Battle, but in the end it was it was Yao and his Rockets over Yi and his Bucks 104-88. Yao's neck beard had 28 points, 10 rebounds and three assists. Yi had 19 points and nine rebounds. • You Do Realize He Could The League In Scoring If He Really Wanted To, Right? Steve Nash scored 11 straight points in the fourth quarter, single-handedly carrying the Suns to a 106-101 win over the ridiculously bad Heat. My Canadian Jesus finished with 30 points and eight assists, including 6-for-7 from 3-point range. • The Last Unbeaten. Um, Kevin Garnett is sort of scary good right now. The 10-time All-Star damn near broke the boxscore posting 27 points, 19 rebounds, six assists and three blocks as the Celtics beat the Hawks 106-83. The C's 4-0 record is their best opening since 1987-88 when they won their first six games, finished with 52 wins and went on to the Eastern Conference finals. • Watch 20/20. Orlando's Dwight Howard had 22 points and 20 rebounds, while Charlotte's Emeka Okafor posted 25 points and 23 boards. Does it matter they didn't play each other? Naw.